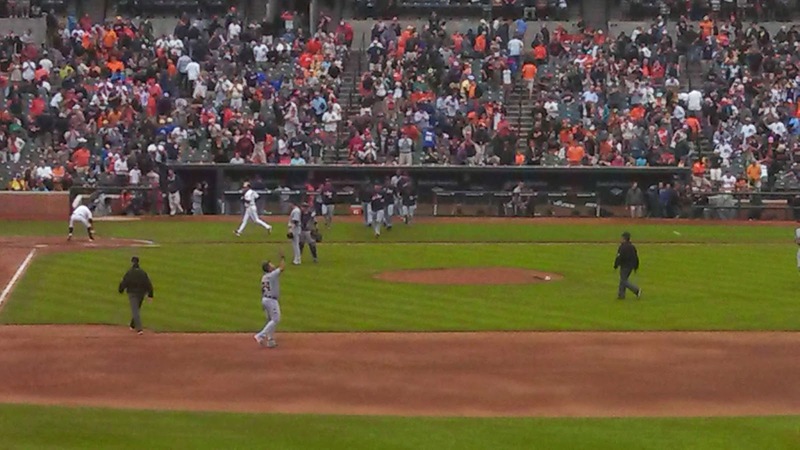 I finally went to my first game at Camden Yards in Baltimore yesterday to see my Detroit Tigers play. 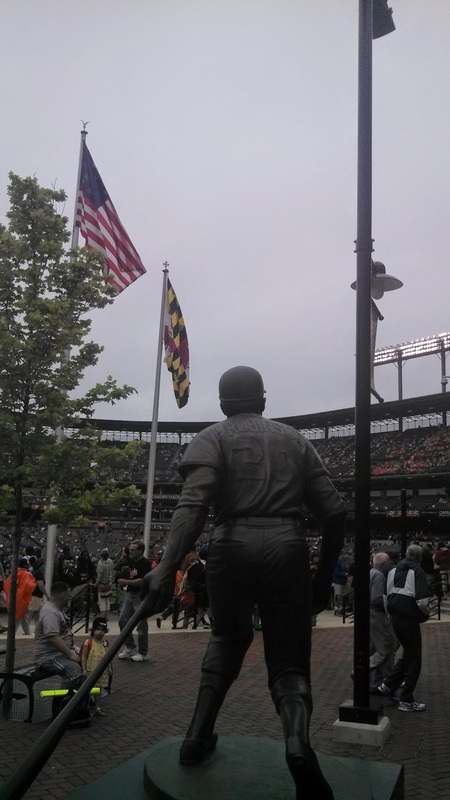 Even though I have lived in the D.C. area for a while, I had never been to a Tigers game in Baltimore because the games always seemed to land on days when I had a conflict. Plus, it is a lot easier for me to take the Metro to a game at Nationals Park in D.C. than to drive an hour (or more) to Baltimore, especially for a night game. I had this game circled on my calendar ever since the Tigers exhibition game against the Washington Nationals was rained out in March. After having two of my last three Tigers games rained out, I decided to wait to buy tickets so I could keep an eye on the weather. 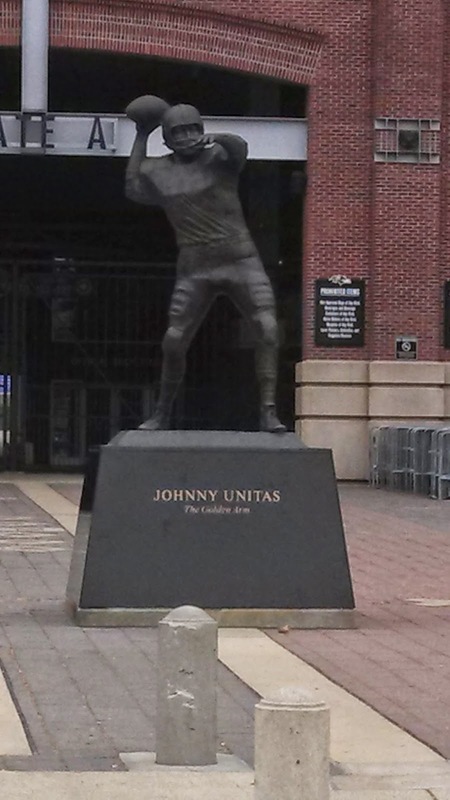 A few days before the game, possible rain was forecast, so I waited until the day before the game to make a decision. After confirming that rain was not likely, I went on StubHub and found a cheap seat in foul territory in left field. The game was scheduled to begin at 12:35 p.m. on Wednesday morning. I left my house in Northern Virginia at 9:20 a.m. I avoided most of D.C.'s rush hour and made it to the stadium’s parking lot in an hour. I parked in Lot F, which is south of Camden Yards near M&T Bank Stadium where the Ravens play. The lot is under an overpass, which probably would help to keep a car cool on a sunny day, and it only costs $8. I read about other lots that were closer to Camden Yards or near Baltimore’s restaurant scene in the Inner Harbor, but most charged significantly more. I had been to Baltimore before, so I went with the cheapest parking option. Lot F is not too far from Camden Yards, but people who have trouble walking might want to find parking closer to the ballpark. Other than walking past the Ravens' stadium, the walk from the lot to Camden Yards was not scenic…pretty much just concrete. Camden Yards was the light at the end of my concrete tunnel. The ballpark opened in 1992 and was the first of the retro style ballparks that have since opened (including Detroit’s Comerica Park). 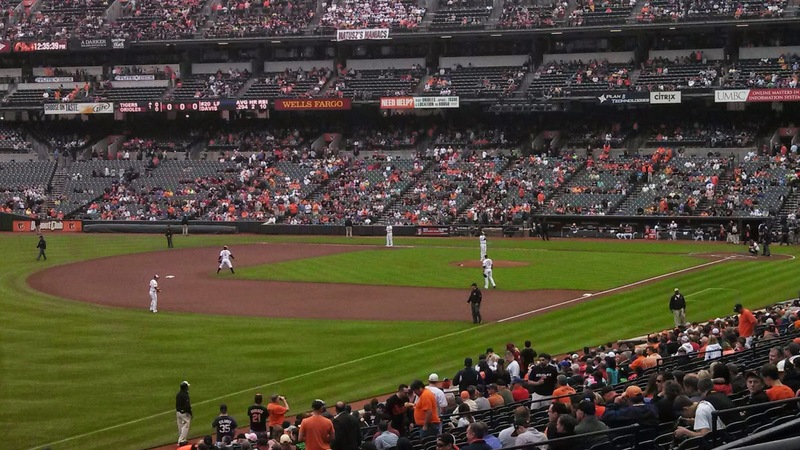 Instead of the multi-purpose behemoth stadiums and domes of the 1970s and 80s, Camden Yards was built for baseball only and to feel like an old ballpark from the early 20th century. 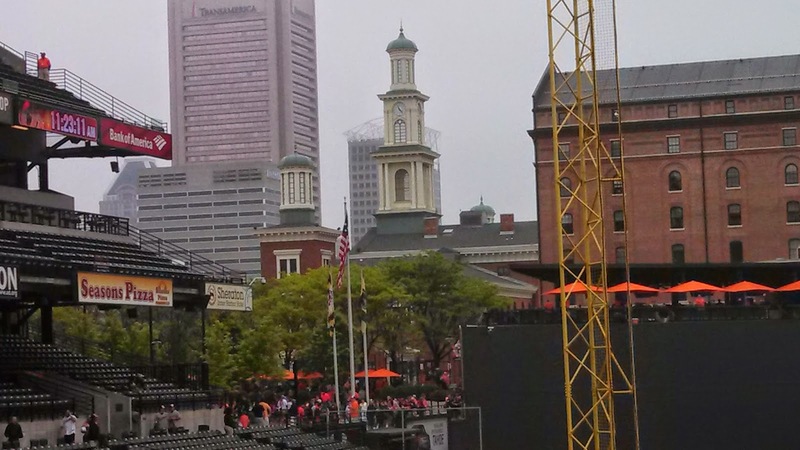 The ballpark blends into its surrounding area and provides a great view of Baltimore's skyline when sitting behind home plate. An old warehouse serves as a wall to enclose the right field concourse. 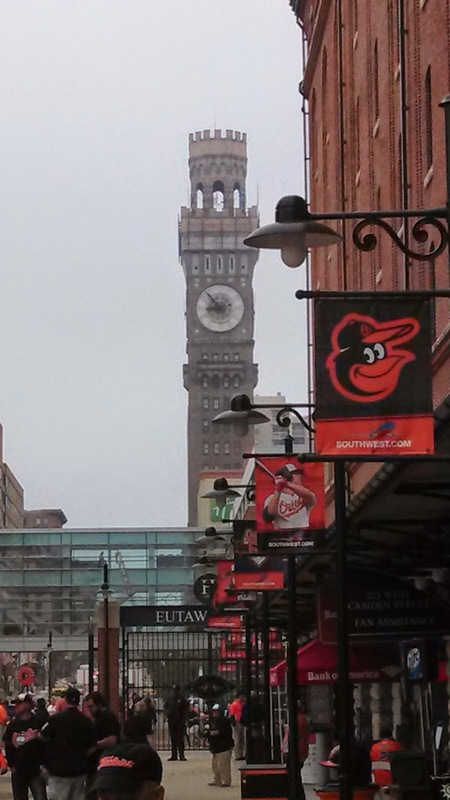 This area is known as Eutaw Street and it has many concessions and souvenir shops. 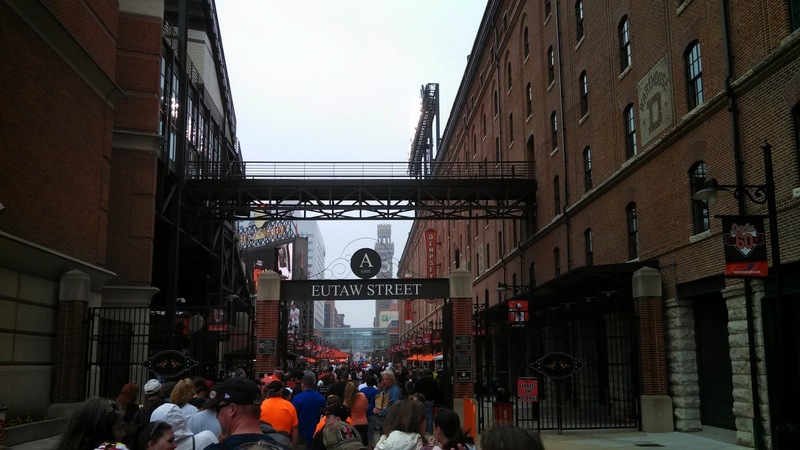 Eutaw Street also has a standing room area called the Budweiser Patio where fans can watch the game. The concourse around the ballpark also provides good views of nearby buildings. The concourse also includes a few outdoor seating areas, statues of Orioles legends like Frank Robinson and Cal Ripken, and a kids' play area. My seat in left field offered great sightlines of the field. Unlike older stadiums (e.g. the old Tiger Stadium), there are no steel posts in the stands to block fans’ views of the field. Although the stadium seats more than 45,000, it feels very intimate. The only problem with my seat was the weather. A cool breeze was blowing directly at my section on this cool and overcast day. I was dressed for warmer weather, so after 5 ½ innings I moved to the Budweiser Patio. Best move of the day. No breeze. The Budweiser Patio is right above the right field fence in fair territory. Since I am 6’5”, I was able to stand behind a few people near the fence and still see the field pretty well. Shorter people might have a harder time seeing from the patio unless they are right next to the fence. The only thing I could not see was a small section of right field directly below the patio, but only one ball was hit in that area during the 3 ½ innings I stood there. Plus, I actually had a better view of the strike zone than I did in my seats. 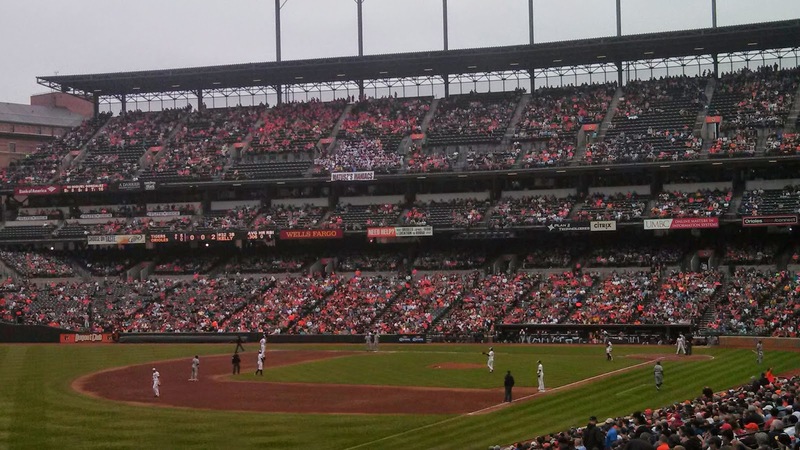 Camden Yards has the typical hot dog stands, peanuts, and Cracker Jack, but it also has a lot more, including soft shell crab sandwiches and Korean barbecue. 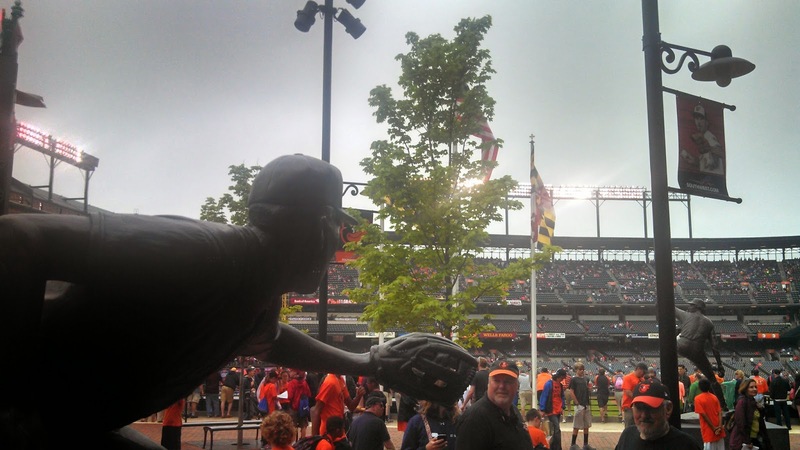 I read several stadium reviews of Camden Yards and decided to try three places: Boog's BBQ, Polock Johnny’s, and Stuggy's. Before you judge me for eating so much, I would like to mention that I was at the ballpark for almost 6 hours and only ate a light breakfast at home, plus do not forget that I am tall so hopefully that gives me a little more room for the food fat to distribute itself. Boog's is the most famous place to eat at Camden Yards because former Oriole Boog Powell owns the place. I was not impressed. The $10 Boog's Sandwich was the most expensive of the 3 meals I had. To be fair to Boog's, they do put a lot of meat on their sandwich, but the meat was chewy and fatty and did not have much taste like good barbecue beef should. Maybe I should have tried the turkey, but with the $10 price tag I’m not sure if I want to give Boog's another try, especially since Camden Yards has so many other food options. 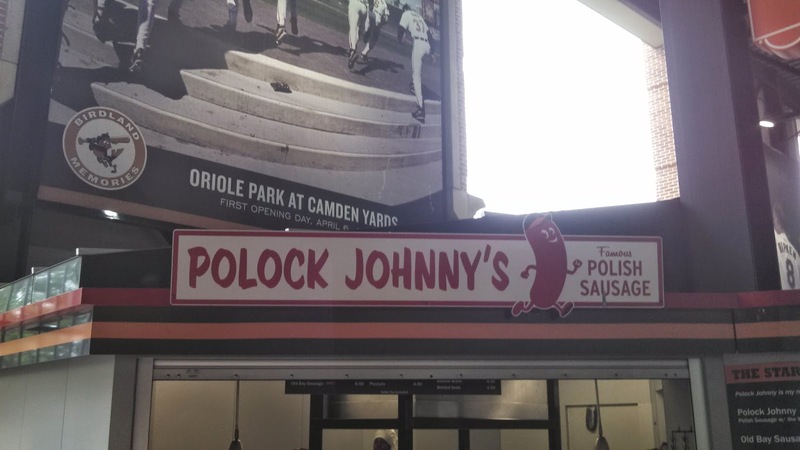 Polock Johnny’s left me wondering if I, as a Polish-American, should be offended or honored by its name. I decided to give Johnny's a chance. After all, the $7.50 price was the most reasonable of the three meals. I ordered one Polock Johnny with the works, which was basically a Polish sausage with a bunch of peppers and onions and Johnny's special sauce. The sausage was good, and the works were tasty. If I make it back to Camden Yards, I would have this again, but I would want to try some of the other food the ballpark offers first. Stuggy's offers a Chicago Dog and a Detroit Coney, but I wanted something with a Maryland twist. 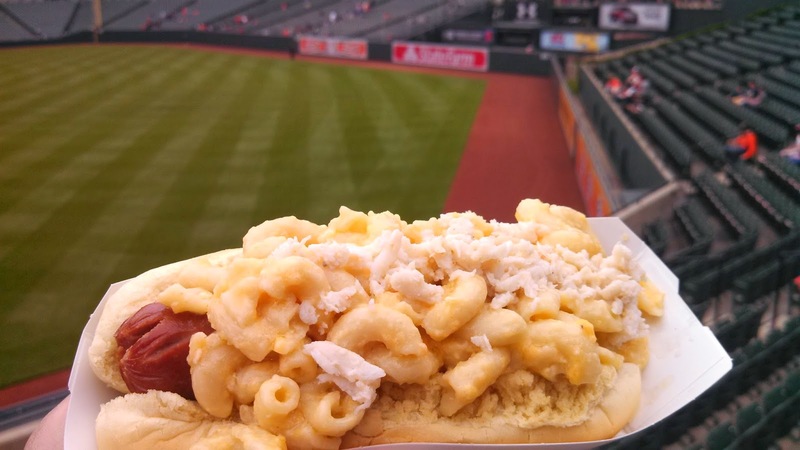 The Crab Mac n Cheese hotdog costs $9, but it is worth the money for someone who likes hot dogs, mac, and cheese and crab meat. I definitely would go back to Stuggy's. 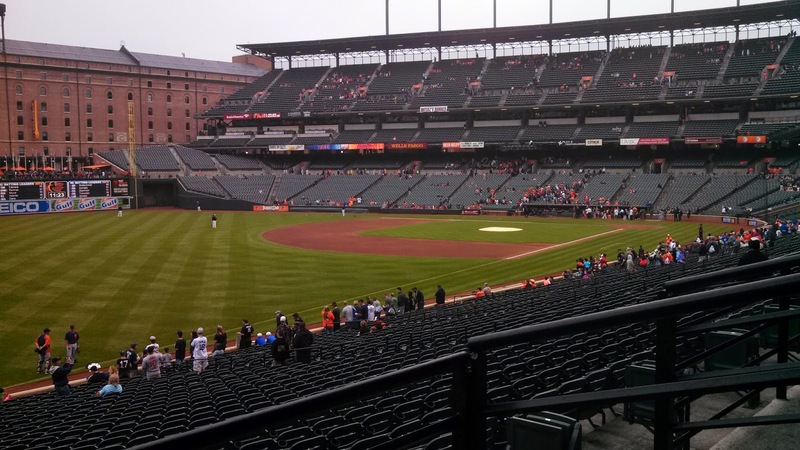 If you do not want to spend a ton of money on food and drinks, Camden Yards does allow visitors to bring their own food in, as well as unopened non-alcoholic beverages. There are a lot of beer options throughout Camden Yards, and beer generally cost between $8 and $10. I had read about a cheap beer stand where you can get $2 canned beer, but I could not find it after several walks around the concourse. The two beers that I tried were locals. 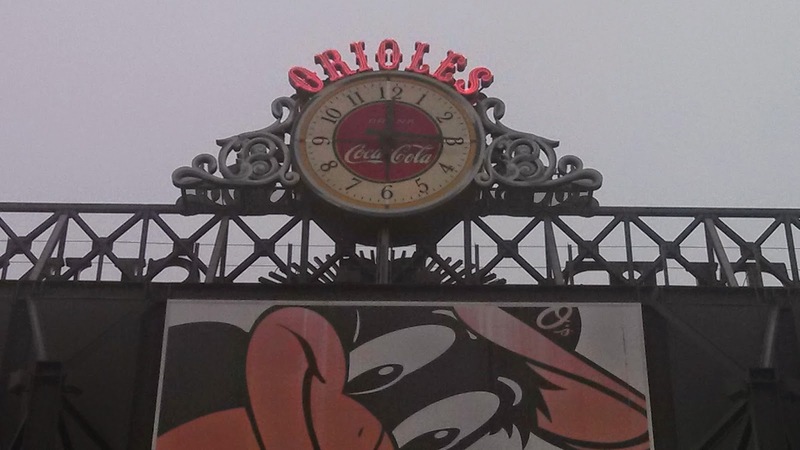 One is National Bohemian, lovingly known as Natty Boh in Baltimore. 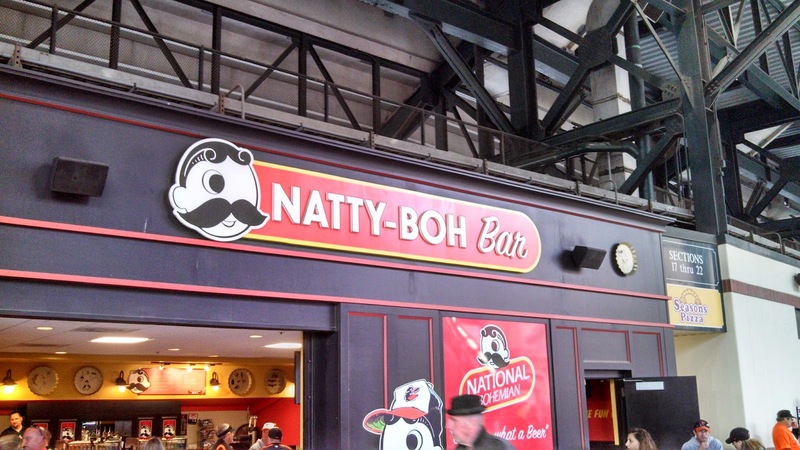 Natty Boh is to Camden Yards what Old Style is to Wrigley Field, a local favorite that is synonymous with baseball. Natty Boh is what it is, a cheap beer that I would not order outside of a ballpark but that I thoroughly enjoyed while watching a baseball game. I also tried a beer by Maryland craft brewery Flying Dog. The Dead Rise Old Bay Summer Ale was refreshing and tasty. I was a little worried that it might taste too much like Old Bay seasoning, but there was only a slight hint of the seasoning that gave the beer an interesting twist. The ballpark was not too crowded. 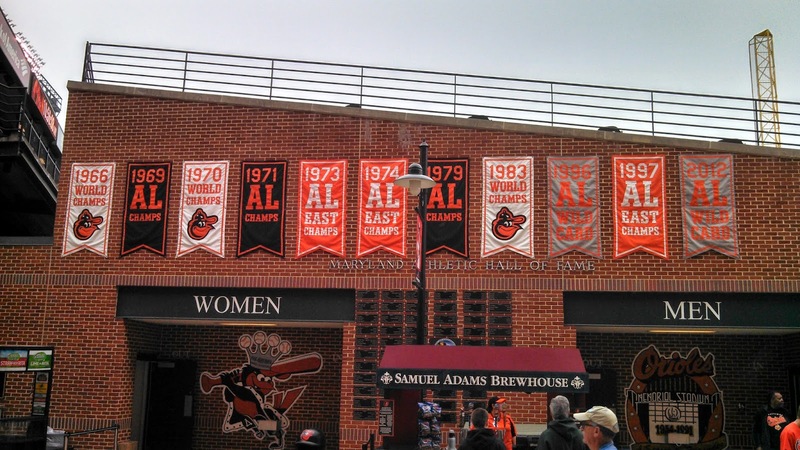 The Orioles were on top of the American League East, and the Tigers came in with the best record in baseball, so I am surprised more Orioles fans did not show. Maybe it was the 12:35 start time on a weekday and the nasty weather. The Orioles fans I observed were all pretty laid back and seemed to be having a good time. The few I briefly chatted with were courteous as well. The only visiting fan I saw getting heckled was a guy in a Yankees hat, but even that was in good fun. 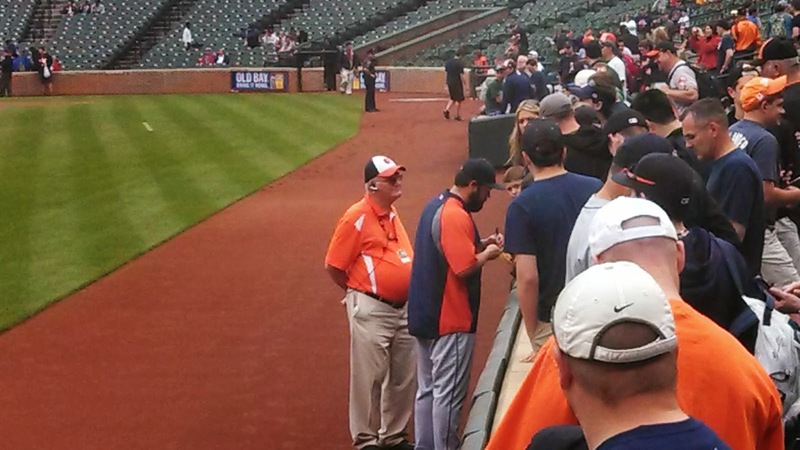 I should also note that the stadium staff and concession workers were courteous as well. Tigers fans showed up in decent numbers. It was nice to see the support, but there were more and louder Tigers fans at the game I went to at Nationals Park last summer. The Tigers won 7-5. They jumped out to a 6-0 lead before the Orioles got 5 runs off Verlander in the bottom of the 5th. Luckily, Rajai Davis hit a home run in the top of the 6th to give the Tigers a two-run lead. Despite a few threats in the later innings, the Orioles did not score again, and the Tigers swept the three-game series with Baltimore. Driving out of Baltimore was a little trickier than my drive to the game. I blame my GPS for sending me onto a street with a railroad crossing (where I waited 3 minutes for a train to pass) and another one with construction, but I eventually made it onto 295 South and did not hit serious traffic until I was back in DC. My trip back took about an hour and forty-five minutes, but that was because I hit DC during rush hour and also randomly found myself on a street near home blocked by two tour buses that wasted another 10 minutes. If the Tigers were playing in Baltimore during the weekend or on a nicer day, I would have probably spent more time in Baltimore. It is a decent city with a lot to do. Unless they meet in postseason, the Tigers will not play at Camden Yards again this year, but Tigers fans should consider a visit next year. 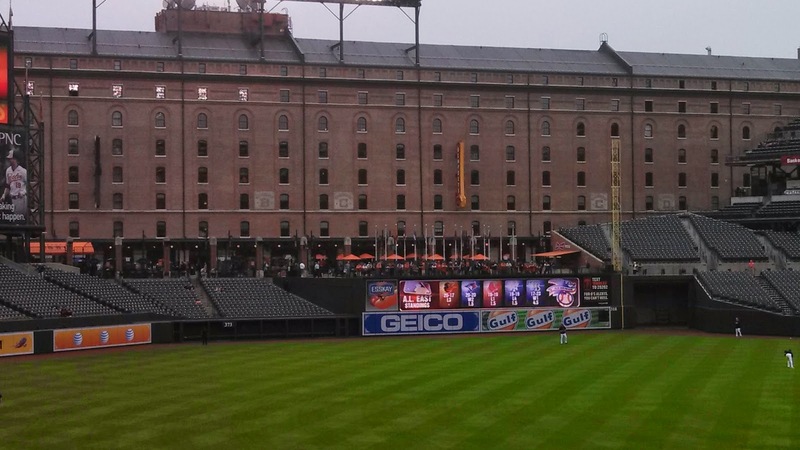 Although the weather was not great, I had a great time at Camden Yards and would highly recommend a visit to this ballpark, especially if you can get a hotel room near the ballpark so you can enjoy walking to the game and around the city. Thanks for your kind words. Camden Yards is a great place. Hope you're enjoying your time in TC.